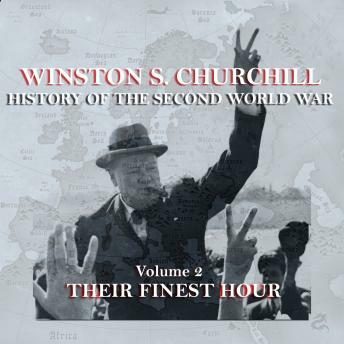 Winston S. Churchill; The History Of The Second World War. Volume 2 - Their Finest Hour. In this short and intense period of the war Churchill's sense of history is profound. 'If the British Empire and its Commonwealth last for a thousand years, men will still say this was its finest hour'. In this second volume Britain stands alone in combat against the mortal threat posed to civilisation, liberal democracy and human decency. Between May 1940 and January 1941 the World witnessed some of the most spectacular military victories of all time. The audacity and brilliance of Hitler's Blitzkrieg staggered both France and Britain. The Allies had prepared for a repeat of the entrenched First World War the Germans for something altogether more terrifying, mobile and destructive. The consequences were almost fatal. Dunkirk was a victory plucked from the jaws of defeat. The Battle Of Britain was defiance against the odds but mastery of the skies remained in British hands and 'Never in the field of human conflict has so much been owed by so many to so few.' In the deserts of North Africa the outnumbered British forces went from victory to victory against Mussolini's conscripted men. There were many hardships and disasters to come but Churchill could rightly proclaim 'Alone but up-bourne by every generous heart beat of mankind we had defied the tyrant in the height of his triumph. The overview is read by Winston S Churchill MP and the volume narrated by Michael Jayston.